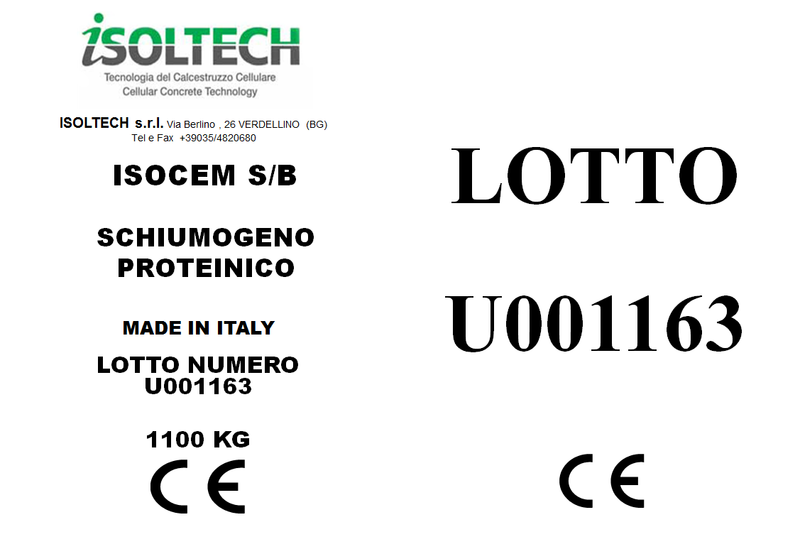 Isocem S/B is a protein foaming agent. The hydrolysed proteins that constitute it form a highly stable foam. Being a protein foaming agent, Isocem S/B is used in all medium density cellular concrete mixes with sand starting from 600 to 1200 kg/m³, where better mechanical strength is required for the production of cellular concrete masonry blocks. The foaming agent for the production of cellular concrete ISOCEM S/B is used in percentages equal to 3% and is suitable for applications such as lightweight blocks, cast-in-place concrete, and prefabricated panels. The foaming agent is sold in 1100 kg tanks or in 230 kg drums. Mechanical strength, thermal and acoustic insulation values correspond to these.